I manually archive the artwork and memes published on the #CharlieHedbo hashtag on Instagram over three hours (8 January 15, 1700-2000hrs, GMT+8) and code the memetic tropes of populism. While much of this artwork appeared to be variations of sentiment published by the more high profile cartoonists around the world (see here and here), others were organic productions of creativity in which different symbols seemed to be competing to gain traction as the primary tropes of signification for the event. What emerges is a collective imagery that has now formed the online vernacular for the #CharlieHedbo incident. As with popular imagery of other social movements mediated online, authorship and origins aren’t always clear, and proper attribution is seldom practiced, especially when emblems are circulating into virality within a very short period of time. 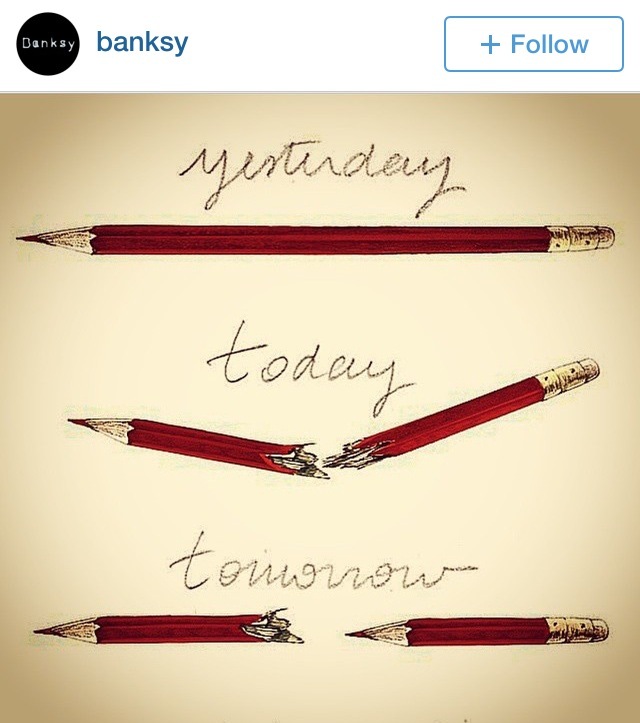 For instance, the ‘Yesterday, Today, Tomorrow’ pencil art piece that was wrongly attributed to Banksy (and cross-posted on an unverified @banksy Instagram account) and widely circulated on the web was later clarified to be produced by French Illustrator @LucilleClerc. The rest of this post archives some popular memetic tropes on the #CharlieHedbo hashtag on Instagram. See also my earlier archive of #OccupyCentral memes here and here. Have any other popular #CharlieHedbo memes and tropes stood out to you? Let’s chat! Beep me!